It would be inappropriate for President Goodluck Jonathan- if re-elected- to reappoint the current Nigerian minister of petroleum. The Chief Justice of Nigeria’s Supreme Court will swear in a newly elected president of the country on May 29, 2015. Whichever of the candidates takes the oath-the incumbent Goodluck Jonathan or his arch rival Muhammadu Buhari-there certainly will be a change of executive cabinet from the one currently in place, whose membership has been near intact for upwards of five years. A crucial position in that cabinet is that of the petroleum minister. If the oath taker is Buhari, himself a former Petroleum Minister, the current minister will have to leave. If Mr. Jonathan wins elections, there is high probability that Diezani Allison-Madueke will continue on the job. In my view, it’d be a value destroying proposition to keep Mrs. Allison-Madueke on the job, but those who are close to the story insist that she’d continue to be Jonathan’s man in the ministry in the next dispensation. In Goodluck Jonathan’s four year rule as elected President, it has been Alison-Madueke, not the Finance Minister Ngozi Okonjo-Iweala, who has controlled Nigeria’s purse strings. It is under her watch that the state hydrocarbon company was most emboldened in determining what it should remit to the state coffers and what it should keep. And what it decided to keep simply ballooned. She has superintended an appropriation of the commonwealth that only the National Assembly has the right to do. At the time that Shell, TOTAL and ENI were divesting from five acreages onshore Niger Delta, the proportion of proceeds from those assets was 55% to the Nigerian state and 45% to the three multinational partners. The NNPC is the government representative in the partnership. If 100 barrels of oil were produced, the NNPC took 55 barrels and paid the money made in selling the crude directly to the National Treasury. Diezani was settling down as minister in 2011 when Shell, TOTAL and ENI were rounding up the sale of their 45% of these assets to Nigerian companies. Her ministry decided that the NNPC would be more active in management of the assets. This is fine. What’s dubious is the way in which the country’s share of the proceeds got diluted in such a way that the net return to the national coffers was no longer 55 out of 100, but far less. The NNPC nominated its operating subsidiary, NPDC, to manage the assets. The NPDC in turn invited a financing partner to fund its share of the operations. The contract with Atlantic Energy entitled it to 30% of NNPC’s share even after the cost oil had been recovered. This is the contract that the minister foisted on the country. The agreement smacks of arbitrariness, was executed in a manner highly suggestive of patronage, with terms that are clearly a give- away of resources. In order to recover its cost in funding the NPDC part of the operations, the terms called for Atlantic Energy Drilling to receive, in the beginning of production, 60% of the volume of crude oil to which NPDC (NNPC) is entitled. This is cost oil. When that cost is fully recovered, Atlantic’s share will drop to 30% of the crude oil to which NPDC is entitled. Please read this carefully; in the post-Shell operatorship phase, after the NNPC equity had been transferred to its subsidiary NPDC, to become the “operator”, with so much fanfare, NPDC had gone into an agreement with a company unknown to industry operatives and registered just months before the deal. The company was charged with the responsibility to fund NNPC share of the cash call for operations in return for 60% (in the first instance) and later 30% (after cost recovery) of the crude oil that should accrue to NPDC (NNPC) and by extension, the teeming Nigerian population of circa 150 million people! In effect, the rightful share of the proceeds from these assets that should flow to the National Treasury drops by at least 30%, all through the duration of the agreement. . The NPDC uses about 30% of the 55% to pay its alliance partners/its funders. Then it refuses to pay the net proceeds to the treasury and instead pays corporate income tax and Petroleum Profit Tax, so the monies accruing to the treasury reduces overall by at least 40%. Note that prior to this NNPC to NPDC transfer, whatever came to NNPC was transmitted directly to the treasury. The transfer of assets from NNPC to NPDC is an illegal transfer of revenue from the Federation account to the NNPC. Not even the president has the power to transfer revenue from the federation account without appropriation. This arbitrary way of doing things is the signature conduct of Diezani Allison Madueke’s tenure. At international fora, the minister would promise bid rounds she knew she would never see the light of day. In her entire tenure there was not a single, open, transparent acreage sale conducted by the government! She would set up panels to investigate aspects of industry processes even though she knew she would not implement their recommendations. For her, everyone is available to be used. .
She had no scruples about making people waste their time. She is no respecter of time herself. Everyone, from IOCs to the smallest Nigerian independent, has a story to tell about how much they are hoping to get hold of the minister, making fruitless upon frustratingly fruitless trips to her office or-as she prefers-her house for audience. IOCs have conducted divestment from 21 acreages under her watch, a sign of inclement investment climate more than anything else, but the minster doesn’t regard it as a blot. Instead it’s an opportunity for her to influence whom she wants to win the purchase. The companies often have to watch her body language to determine who to sell to. 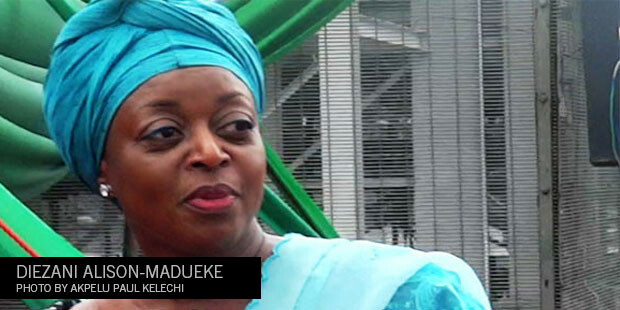 When Diezani Allison-Madueke took office in 2010, she moved the (then nine year old) Petroleum Products Pricing Regulatory Agency (PPPRA) from the presidency into the ministry, directly under her. Between the period that the PPPRA was established in March 2001 and the end of 2009, the annual petroleum subsidy (the difference between actual cost of petroleum products and the regulated price at the pumps) was in the range of $3-4Billion. By the end of 2011, the annual subsidy cost went up to $9Billion. After the public took to the streets to protest, threatening to shut down the economy, the subsidy dropped to $3.5Billion. Between the $3.5Billion of 2009, the $9Billion of 2011 and the $3.5Billion of 2013, the Nigerian population could not have grown by more than 10%.or declined by same. And yet the data suggests that the demand tripled and then shrank! Diezani Magic. If Goodluck Jonathan is re-elected, and he re-appoints Diezani Allison Madueke, he would be doing injustice to the wishes of the millions of Nigerian voters, who see the 2015 elections as about change for progress. Mrs. Allison-Madueke has found it difficult to work with people. In four years on the job she has seen out three successive heads of DPR, the industry’s regulatory agency and fired four Group Managing Directors of NNPC. The game of musical chairs in the top echelon of these agencies over the past few years suggests that the most important criterion for keeping the job is an undivided commitment to doing Diezani’s bidding. She also has the capacity to pursue vendettas even after dismissing the non-compliant heads. Of the 14 acreages divested by Shell in five years the only one where pre-emption rights were execised appears to be motivated by the said vendetta. It’s still early to call who Nigerians will elect in the February elections, but in the event it is Goodluck Jonathan, it’d be unfair to foist Diezani on the country any further. In due course we shall expose all the dead bodies buried under HER watch.All the atrocities committed by her and her surrogates AITEO-BENEDICT PETERS being the largest beneficiary of her brigandry, IGHO SANOMI ET AL such as the blatant stealing of kerosene from Warri Refinery without paying for it and re–importing back into the country and collecting subsidy payments.Together with fraud that is the swap arrangement with Wagbasoma and Tonye et al. Now that power has changed hands we shall ensure that her, her surrogates,fronts and her sister Winihin whose husband got appointed on the board of the CBN to oversee thier transfers and looting..all go to jail…..
Diezani JUDGEMENT day is here and you shall indeed be served judgement…….